What’s more secure: The iPhone or the Droid? As the mobile payment industry continues to grow and evolve, mobile security has become a key issue when deciding which smart phone brand to buy. The Android and the iPhone both dominate the smart phone market, but which is more secure for accepting credit card payments through your mobile phone? First, let’s look at the similarities: Both the Android and the iPhone have idle-time screen locking mechanisms, which require a password to protect against anyone who picks up your abandoned phone. Also, apps can never access the underlying hardware of either smartphone because layers of software control all hardware interactions – acting as the carrier pigeon between the device and its operating system. Both devices also protect against web-based attacks. Both mobile devices require application testing, although Android enables way more distribution channels, which means more opportunities and methods for viruses to infiltrate your phone. But on the other hand, Apple has been known to approve some apps that they later disapprove after they function improperly. One major difference between the two is how applications are installed. Android makes users agree to a list of requirements the app needs to function properly before downloading. Apple, on the other hand, enables you to download the app, but doesn’t require you to agree to any requirements until the user chooses to run the application. Furthermore, if you lose your Android, you cannot run an auto erase to destroy private information – whereas with Apple, you can. What does this all mean? There are loopholes with both brands, but neither has shown as the dominant leader in mobile security. So, feel free to choose based on other factors, like looks, functionality, and cost. 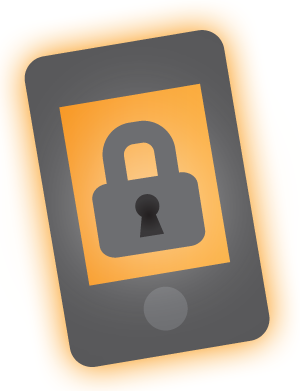 Regardless of which phone you pick, below are 5 easy tips to securing your mobile device. 1) Always change your password (and voice password) as soon as you acquire your phone. Both seem to be relatively secure, but definitely have their weaknesses. If I had to put my money on one, I would say the iPhone because of the added scrutiny Apple puts on every step of the production process as well as app control. Android is much more like Windows in how open it is, so it leaves it open for more attacks. On the flip side, hackers tend to go after the bigger market, and right now that is the iPhone. Actually Android is linux based which is more secure than windows and considered just as secure as apple. But, they are both popular so people making malicious software will target both.